In the morning, you might like to try one of the several hikes featured on the map from the National Park Visitors' Center. In the mid-afternoon, drive down Chain of Craters Road, which offers one of the best vistas of the vast fields of both pahoehoe (smooth) and a'a (rocky) lava. The road can end abruptly based on where the new flows ooze forth. Current eruption information can be obtained by calling 808-985-6000. 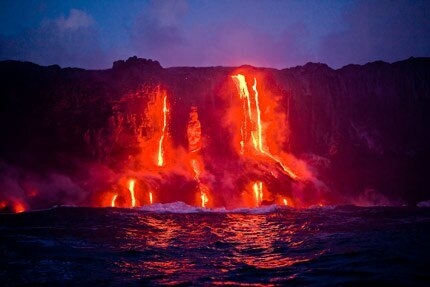 There are not always surface flows, but if there are, hang around until after sunset to see the eerie glow of hot lava. It's simply not predictable when and where there will be fresh flows, but the rangers will provide you with up-to-the-minute information about where you might see them by calling the number in the preceding paragraph. If you're the kind of person who loves a bird's eye view, a great way to tour the volcano and pretty much guarantee that you'll see flowing lava is to take a helicopter tour. The Circle of Fire tour from Blue Hawaiian Helicopters provides the vantage point to witness volcanic activity and the awe-inspiring sight of its flow into the sea. You can even purchase a video of your actual flight from Blue Hawaiian to take home with you. You may decide that there is much more you want to explore on the Big Island, or you can decide to fly to Maui to visit Haleakala ("house of the sun"), the 10,000-foot dormant volcano which created a majority of the island. Stay the night at Kula View Bed & Breakfast, a Victorian suite located on the upper level of a private home with its own entrance and deck, where the owner is more than happy to loan blankets and warm clothing for an early morning trip to watch the sunrise over the top of Haleakala. Have dinner tonight at the best of the upcountry Maui restaurants, Bev Gannon's Hali'imaile General Store — Gannon was one of the 12 original chefs of Hawaii Regional Cuisine. The very best time to see Haleakala is at sunrise. That means you should be up by 4 a.m. in time to drive the Crater Road and welcome the sun at Haleakala National Park (www.nps.gov/hale/). Some say that one of the natural wonders of the world is the view of dawn hitting the inside of the crater. The best view of Haleakala Crater is from the Visitors' Center, where you can see the entire magnificence of this 7.5 mile-long, 2.5 mile-wide and 21 miles-in-circumference crater, which has a drop from top to floor of 3,000 feet. You'll want to take in the exhibit on Haleakala and volcanoes. However, serious sunrise viewers will not rest until reaching the crater summit at Puu Ulaula Lookout. From this lookout you will see three of Hawaii's major islands — Lanai, Molokai and the Big Island — as well as all of Maui. (It is very cold up here at 10,000 feet, so dress accordingly.) Truly, this is one view you will never forget. 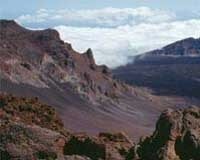 The physical appearance of Haleakala Crater is often compared to the surface of the moon. A short hike into the crater provides an interesting view. (A full hike to the bottom requires three days and considerable preparation, so save that trip for another visit). There are also guided hikes available, and you can even stay in one of the three cabins inside the crater, but there's a waiting list — inquire at the Visitors' Center. Heading out, it's a short trip back to Bloom Cottage to prepare for your journey home, but it's hard to imagine that you won't be planning a return trip very soon.